The Wall Street Journal published a front-page article in its December 6 edition, “Oil’s Growing Thirst for Water,” that highlights issues with the oil and gas industry’s demand for water in the Eagle Ford and other shale plays. The article quotes Darrell Brownlow, a hydrologist and geochemist and a landowner in South Texas about whom I have written previously. 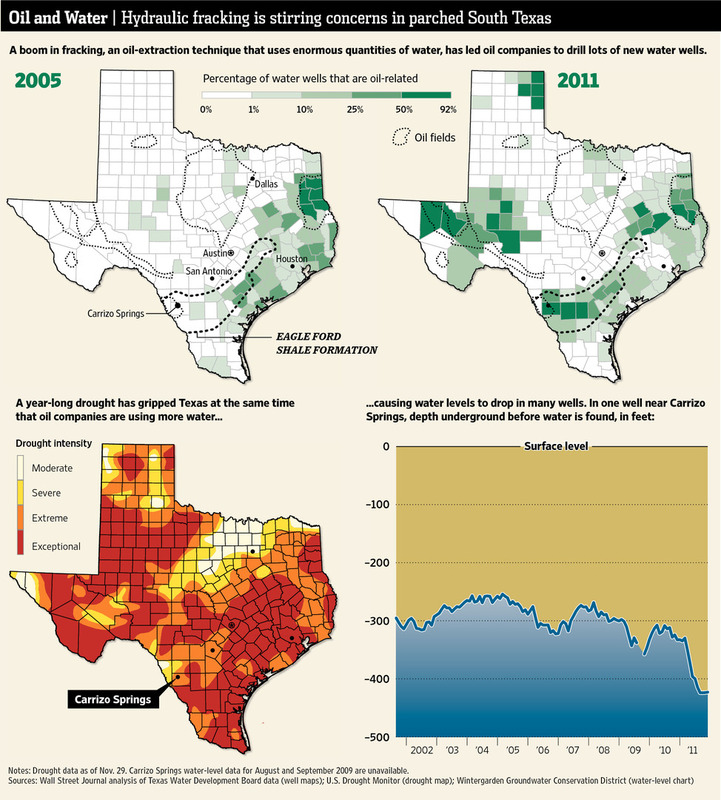 The WSJ article highlights the coming conflict between the oil and gas industry’s demand for water and the growing demands on groundwater in Texas. There are about 6 million acres in the Eagle Ford play, and a possible 20,000 oil and gas wells (one well per 300 acres). An average frac job uses 15 acre-feet of water (4,887,765 gallons, or 115,375.5 42-gallon barrels). So, the frac jobs on those 20,000 wells would use about 300,000 acre-feet of water over the life of the play. Current withdrawals from the Carrizo Aquifer are about 275,000 acre-feet per year; so the entire demand for frac water from Eagle Ford wells would equal about one year’s withdrawal of water from the aquifer. At a rate of withdrawal of 275,000 acre-feet per year, groundwater management studies estimate that the Carrizo water table will drop an average of 30 to 35 feet by 2060. Dr. Brownlow says that, if a successful Eagle Ford well makes 300,000 to 400,000 barrels of oil at $80/bbl, the return to the landowner would be $520,000 per acre-foot ($1.60 per gallon). In contrast, the return to a farmer using the same acre-foot of water to irrigate corn, peanuts or coastal hay would be $500 to $1,000 per acre, or about $250 per acre-foot of irrigation water. “The point here is that using groundwater from the Carrizo for hydraulic fracturing in the Eagle Ford Shale has enormous economic potential for landowners, oil production companies and the entire region. Moreover, from a geologic and water planning perspective, additional impact on the aquifer appears minimal,” says Dr. Brownlow. The oil and gas industry uses only 1.6% of the water consumed in the state. But this use is concentrated in areas where drilling activity is located, often in arid portions of the state, and the use is growing rapidly. As can be seen from the above graph of one water well, if your well is the one affected, it is an important issue. And the water used for fracing in the Eagle Ford is not returned to the ecosystem; it either remains in the formation, or if it returns to the surface, is it reinjected into licensed disposal wells. In Texas, the oil and gas industry is exempted from regulation by local underground water districts, which have authority to permit and regulate withdrawals from underground aquifers. Those water districts are now in the middle of establishing “desired future conditions” for the aquifers within their jurisdiction and rules to assure that withdrawals are regulated so that those desired future conditions are met. Because those water districts have no authority to regulate wells used for oil and gas exploration, they cannot predict or control the effect of industry uses on their future supplies of water.